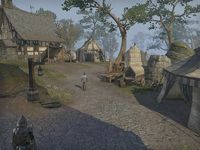 Help the Duchess deliver her message from the castle to the Alik'r camp. Duchess Lakana needs someone to take a message to the leader of the Redguard camp outside the gates. Sir Hughes suggested I act as her messenger and report on what she reveals. Gain entry to the Redguard general's house. Following Army at the Gates, continue talking to Sir Hughes. He needs to talk to the Duke about your findings, but he's wary about accusing the Duchess without knowing what she's up to. Lakana has spoken with Envoy Darima and now wants to go speak in person with the Redguard general. Obviously, Sir Hughes can't allow that, but the envoy can't deliver a message either as the Duchess has forbidden it. However, you can do the job; you will already have Lakana's trust after arranging for the envoy to get in, according to Sir Hughes. Go offer your services. Duchess Lakana is in her room along with Envoy Darima, up the stairs from the library. Lakana is grateful you intervened in the situation regarding Dame Falhut; she is alone, she feels, with no one she can trust in Alcaire Castle. She wonders if she can even trust the Duke himself, as someone has been trying to kill her. A taste-tester died a few days before, from a poison intended for the Duchess. When asked why, Lakana will speculate that rivals for the Alik'r throne may be trying to destroy the Covenant. King Fahara'jad, Lakana's father, has been trying to identify the assassins. Lakana needs to speak with General Thoda outside, but as she is not allowed, she feels stuck. Envoy Darima can't go either, as the gates might close and lock behind her and Lakana desperately needs her friend right now. You may go, she says when you offer, but General Thoda may not allow you to see him. If you can duel and best some of his warriors, he will be curious enough to want to see you, and you can deliver the message. Head down to the camp at the river. 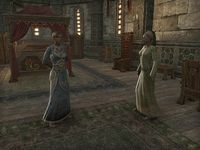 You can challenge any Alik'r Bravo or Alik'r Champion through dialogue, and there are many to choose from. Once you have dueled five successfully, Thoda's House, the southeastern building in the camp, will be open to you. General Thoda is inside. Though at first he will be angry that you picked fights with his soldiers, explaining the situation will give you the mastermind's name, spoken by the poison-maker himself before he died: Falhut. It is up to you to protect Lakana now, so return to the castle quickly. Lakana will be surprised that Dame Falhut would resort to murder, but she will give you 86 gold for your help. Continue talking to her to receive the next quest, Life of the Duchess.